Boston Terrier Pug Mix – Is The Bugg The Right Dog For You? You are here: Home / Breeds / Mix / Boston Terrier Pug Mix – The Bugg Is charming and amusing but is it right for you? Boston Terrier Pug Mix – The Bugg Is charming and amusing but is it right for you? Are you contemplating bringing a Boston Terrier Pug mix puppy into your life? Welcome to our complete guide to the Boston Pug mix! The Boston Terrier Pug mix is the result of a Boston Terrier crossed with a Pug. This cross breed is affectionately known as a Bugg. A Bugg aims to combine characteristics of the friendly, bright, and amusing Boston Terrier with the charming, mischievous, and loving Pug. Unfortunately, both breeds are structurally unhealthy. The Bugg mix is also a first-generation mix, and there is controversy surrounding any so-called designer dogs. Before we take a closer look at the Boston Terrier Pug mix, let’s delve into the specifics of this debated subject. Mixed breed dogs like the Boston Terrier and Pug mix are the offspring of two different purebred breeds. Purebred devotees believe that there are numerous advantages to keeping dog breeds pure. They argue that since the dog’s ancestry is known, puppies will be predictable in attributes like size, temperament, and health issues. This allows breeders to know which tests to give dogs before breeding to reduce the risk of inherited illnesses. That information is not available for dogs of mixed heritage. However, even purebred advocates will admit that the smaller the gene pool, the greater the risk of health problems. Mixed breed dog enthusiasts say that crossing two different breeds reduces the risk of inheriting illnesses or other weaknesses related to inbreeding. If you want to learn more about the purebred vs mixed breed debate, check out this article. Even when we look to the experts, there are conflicting reports. Studies like this one claim that purebred dogs are more likely to be susceptible to some disorders and mixed breeds to others. This study on hybrid vigor claims that health is improved in mixed breed dogs. While we’re not taking a side when it comes to the purebred versus mixed breed debate, the most important takeaway is that all breeders must put the welfare of the dog first and foremost. What Is a Bugg Dog? Like many mixed breed dogs, the exact origins of the Bugg dog breed are not known. It seems likely that the Boston and Pug mix started in the US sometime in the 1980s. A hybrid breed’s appearance is never completely predictable. You’ll see pictures of Pug Boston Terrier mix puppies that look more like the Boston Terrier. Other Bugg dog pictures that closely resemble the Pug. 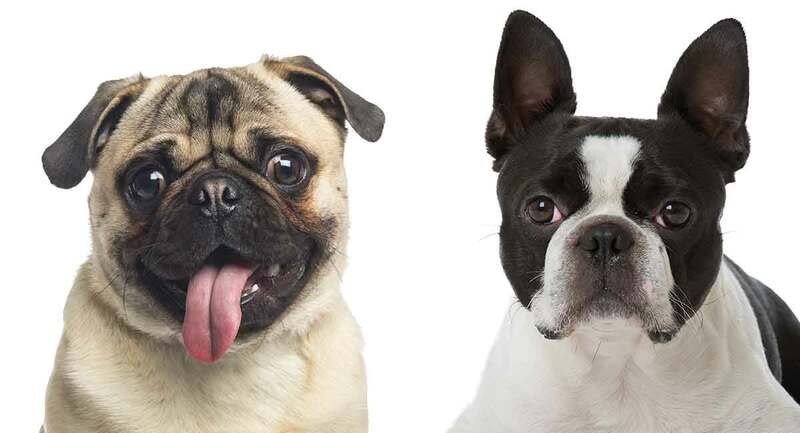 To get a better sense of what to expect from a Pug and Boston Terrier mix puppy, let’s look at the history of each of these breeds. In 19th century England, blood sports were popular. This led to the crossing of terriers with bull-type breeds to create dogs who would be good fighters. In Liverpool, sometime in the late 1860s, a Bulldog was crossed with a white English Terrier. The result was a muscular dog named Judge. An American bought Judge and brought him to Boston. Judge then became the common ancestor of almost all true Boston Terriers. He was supposedly strongly built, with a square head. He weighed about 32 pounds and was dark brindle in color with a white stripe in the face. Over the next few decades, selective breeding altered this muscular fighter into a smaller, more appealing companion dog, originally called the Round Head. Their name was changed to Boston Terrier in honor of the city where they were developed. The Pug’s history dates back some 2,000 years to ancient China. They were bred as the pampered pets of emperors who favored flat-faced toy dogs. It wasn’t until the 1500s that Dutch traders brought the breed to Europe. Legend has it that a Pug saved Holland’s Prince of Orange by barking to warn him of an attack by Spanish troops. When William and Mary of Orange became England’s monarchy in 1688, they brought their beloved Pugs with them. Over the last hundred years or so, extreme facial shortening, achieved by selective breeding, has dramatically changed their appearance and caused health problems for the breed. A Boston Terrier will usually weigh between 12 to 25 pounds and stand between 15 and 17 inches tall. A Pug is somewhat smaller, typically weighing 14 to 18 pounds and measuring 10 to 13 inches. Bugg puppies can take after either parent, which means they can range in height from 10 to 17 inches and weigh up to 25 pounds. What Do Boston Terrier Cross Pug Puppies Look Like? According to the American Kennel Club (AKC), the Boston Terrier is brindle, seal, or black in color and evenly marked with white. Smooth-coated, short-headed, and compactly built with an intelligent expression describes the Boston’s overall appearance. The Pug is square and stocky with a large, round head and prominent dark eyes. The colors of the Pug are fawn or black. Is your heart is set on a certain color, like a brindle Boston Terrier Pug mix? Look at the parents to get an idea of whether they’ll have brindle Bugg puppies. One of the best things about getting a Boston Terrier Pug mix—besides all of those adorable Pug Boston Terrier mix pics you can show your friends—is their temperament. Both the Boston Terrier and the Pug are very loving, even-tempered, and friendly. Due to the similarity in their temperament, you can be quite sure that you’ll be getting a wonderful companion who’s playful and likes plenty of cuddling. When it comes to exercise, Boston Terriers can vary from dog to dog. Some are very active, while others only need a brisk daily walk. Pugs are happy being couch potatoes. This, combined with a tendency to overeat, can lead to obesity in the breed, and moderate daily exercise is essential. Both the Boston and the Pug have short, glossy coats that require minimal maintenance. The Bugg breed will require weekly brushing to remove loose hairs. Like with all breeds, you will need to clip their nails regularly. Being a mixed breed doesn’t eliminate the chance the Bugg dog will inherit health issues the parent breeds are predisposed to. Both the Boston Terrier and the Pug are brachycephalic breeds. The structure of their short, flat muzzles and deep facial folds makes them prone to serious respiratory problems. The dark, protruding eyes of brachycephalic breeds are very appealing, but also make them vulnerable to eye diseases. Boston Terriers are prone to cataracts, glaucoma, and corneal ulcers. The shortened noses of these breeds might be cute, but it impacts their quality of life. Your mix is very likely to have a flat face too. Buggs have a life span of 10 to 13 years. As with any dog breed, early socialization and positive training methods are essential. Both the Boston Terrier and the Pug love to please, which makes them fairly easy to train. They’re also very sensitive breeds whose feelings are easily hurt. Praise should always follow any gentle corrections. Treats also make a great incentive. Their small size and moderate exercise requirements make the Boston Terrier Pug mix very adaptable to city living and apartment life. Playful and affectionate, they love to be close to their owners and are happiest when people are around. They can be a bit stubborn and even territorial. They also might have trouble sharing if there are other pets in the home. Is the Boston Terrier Pug Mix a Good Family Dog? The Boston Terrier Pug mix makes a fantastic family companion. Buggs are great with children and love to spend time playing games. The Boston Terrier Pug mix is happiest when they get lots of attention and are treated like family. Choose a breeder who allows you to visit the kennel facilities so you can see the conditions they were raised in. Observing the siblings and parents is important to determine overall health and well-being. Ask to see the papers that prove health testing. Knowing the health history of a Boston Terrier cross Pug puppy’s parents is essential for brachycephalic breeds who can have a number of serious health issues to deal with. Should I Get a Bugg? Only you can know for sure if this is the right dog breed for you. But we can’t recommend any breed that can expect to have severe health problems. Their quality of life will be poor, and your vets bills will be high. If you love little dogs and fancy a mix, then a dog rescue is a great place to look. Or you might like to consider the Cockapoo, another Poodle mix, or another Boston Terrier mix.